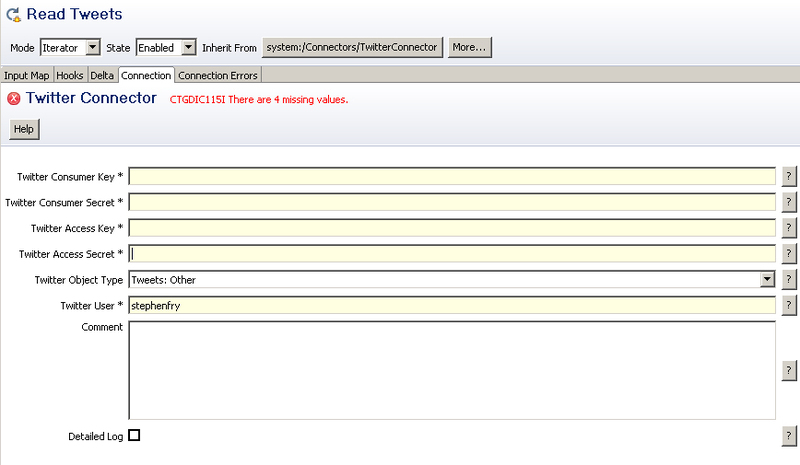 A while back, I wrote myself a Twitter connector for Tivoli Directory Integrator. I was bored one weekend and it seemed like an interesting exercise. After all, it was a good opportunity to find out about Twitter's migration to OAuth. In the example above, I'm processing Twitter Object Types of "Tweets: Other" and looking at Stephen Fry's tweets. The Consumer Key/Secret and Access Key/Secret are not displayed for obvious reasons! Indeed, obtaining the key/secret combinations is a little fiddly though there is plenty of documentation out there to help you obtain that info from Twitter. Wow, you may be thinking. But why would I want to do that? Indeed. I guess, as I have alluded to in this blog before, you could have your assembly lines "tweet" upon component failure so that an out-of-hours support person can respond. After all, tweets can easily be delivered to smartphones at no cost to the organisation. NOTE: jtwitter.jar and signpost-core.1.2.1.1.jar are open source code provided elsewhere on the net. I've added these versions here as they are known to work with my connector. 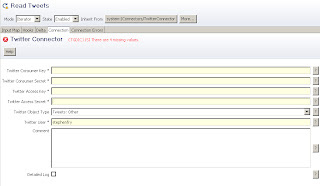 Drop the twitterConnector.jar into TDI_HOME/jars/connectors. Drop the other JARs into TDI/HOME/jars/3rdparty. If you need help getting your keys/secrets, I may be able to sort you out, though you will probably appreciate figuring it out for yourself in the long run. You can look through TwitterConnector.java to get a feel for the full source code. I've had fun building the connector and it can certainly ease the pain of putting together Assembly Lines that need to make calls to Twitter by having such a neat interface. I hope you have fun too.